In this lecture I will sketch out a larger project on the forms of writing with images and the book as intellectual instrumentfor critical pedagogies in cultural theory and architectural humanities. 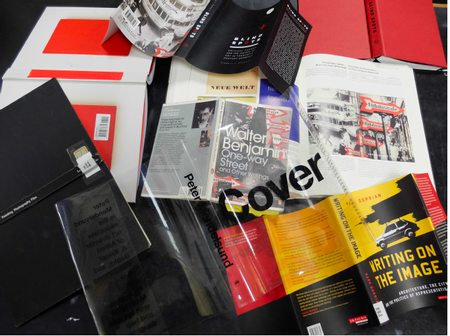 The project assembles a series of studies, or ‘stories’, that examine the book cover as a threshold image-object in academic research and the role of the book form and graphic space in the reading experience of theoretical texts on the image and the politics of representation. Considering the book (after Mallarmé) as “architectural and premeditated”, the stories focus on paratextual mediations between the writer, the publisher and the reader, and the image-text-space relations in forms of reading and contemporary practices of academic writing. I will attend to a blind spot in critical attention to the book form and the most visible paratext, the book cover. Focusing on Walter Benjamin’s 1928 Einbahnstraßeand its photomontage cover by Sasha Stone, I will discuss the forms in which Benjamin’s text has circulated among Anglophone readers since its first publication in 1978. While other experimental texts referenced in cultural studies, such as Laszlo Moholy-Nagy’s Painting, Photography and Film, have been published with close attention to the original book design, Benjamin’s One-Way Street, despite its iconic status evident in several popular editions, is never read in its original form by those studying cultural theory in English. Frederic J. Schwartz’s remarkable study of critical theory of art in twentieth-century Germany, Blind Spots(2005) – one of the few sources that pay attention to the book space of One-Way Street –will be discussed in the context of the recent explosion of popular interest in the physical form of the book and lavish trade publications on the subject, ranging from superbly researched Jürgen Holstein’s The Book Cover in the Weimar Republic(2015) to a celebration of individual design genius of Peter Mendelsund’s Cover (2014). The ascendance of the generic glossy hardcover for academic texts, the education industry’s preoccupation with digital formats of reading and writing, and the continued standard practice at university libraries of removing and discarding the dust-jackets often without retaining bibliographic data necessary for scholarly work, all point to both the problematic agency and theoretical potential of what Gerald Genette termed ‘peripheral paratext’. DR ELLA CHMIELEWSKA is Programme Director of Cultural Studies at the University of Edinburgh School of Architecture. Her research and teaching concerns the city and visuality: relationships between image and text in public space; urban writing and place-marking (graffiti, inscriptions, and signage); place, memory and semiotic landscapes (practices of commemoration, representation and erasure); objects and place in/of visual culture. Her recent work focuses on image/text and architectural imaginary in writing: “Writing with the photograph; espacement, description, and an architectural text in action” in Anna Dalhren et al (eds) Representational Machines: Photography and the Production of Space (Aarhus University Press, 2013); Afterword. “Postscript as Pretext” in Mark Dorrian, Writing on the Image: Architecture, the City and the Politics of Representation(IB Tauris, 2015), and ‘Warsaw Afterimages: Of Walls and Memories’ Andrea Mubi Brighenti and Mattias Kärrholm (eds) Urban Walls: Political and Cultural Meanings of Vertical Structures and Surfaces(London and New York: Routledge, 2019). 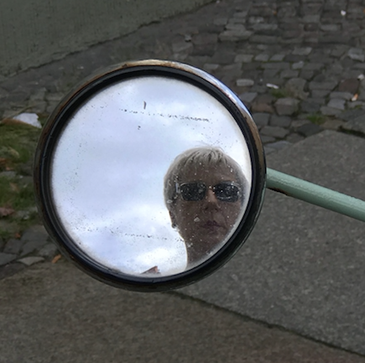 In addition to the Cover Storiesproject she is currently working on a book on forms and surfaces of place memory, Warsaw Surfaces: Transpositions, Objects, Shadows.